Product prices and availability are accurate as of 2019-04-19 10:58:00 UTC and are subject to change. Any price and availability information displayed on http://www.amazon.com/ at the time of purchase will apply to the purchase of this product. 1. These viking necklaces are made of TIN. High quality TIN has high resistance to rust, corrosion and tarnishing, which requires minimal maintenance. TIN is one of the most bio-compatible metals, so TIN jewelry is amazingly hypoallergenic because of its anti-allergic properties. As one of the strongest of all jewelry metals, it does not oxidize and will be very durable. 2. 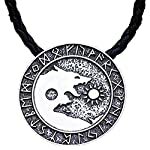 In Norse mythology, each of these pendants has different meanings. They can be worn as an amulet, bringing courage, strength and power to the wearer. 3. Please note, these necklaces are handmade, so each of them is truly slightly unique to another. The colors might slightly differ from the photo due to different display settings.
? DESIGN CONCEPT 1: Viking necklace with different pendant has different meanings. The Hammer and Axe is a symbol of power and strength. The Wolf symbolizes the strength, endurance and freedom. The Mandala means meditation and peace in heart. The Vegvisir, as norse compass means wayfinder, will help guide the holder through the rough journey of life. The Valknut signifies the afterlife and it is a popular talisman of protection against spirits. ? 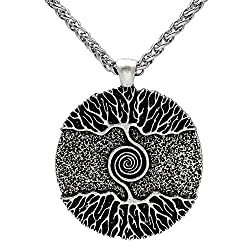 DESIGN CONCEPT 2: The Tree of Life is a symbol of our interconnection to each other and a visual prayer that the cycle of life may endure through family, friendship, strength and love. The Kolovrat, a sunny character means the infinity of life on earth, the alternation of day and night, cold and warmth, dark and light, which gives a long life, health and well-being. Wear your love, wear your story is our design concept. ? 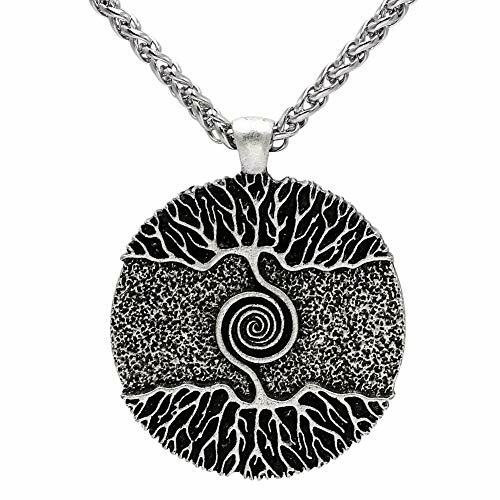 GIFT IDEA: Wearing it as an amulet. It is a good choice for party, holiday, travel and daily life. 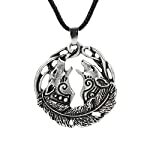 These viking necklaces are a surprise for your loved person on Christmas, Birthday, Anniversary, Celebration, Valentine's Day, Wedding, Engagement, Congratulation, Party. ? 100% SATISFACTION GUARANTEE: If any problem occurs, please feel free to contact us. We provide 100% satisfaction and money back guarantee for every customer. We are always engaged in providing high quality jewlery and best service for you. We are looking forward to your great feedback, since your feedback is our greatest motivation. Make sure you have Add this item to your Wish List to keep an eye on our latest offers and promotions. ? UNIQUE BUILD: The pandent is made of environment-friendly TIN material with stainless steel square rolo chain, free of nickle & lead, nontoxic. TIN is hardly tarnished, oxidized or scratched, superior to most precious metals. These pendants are perfectly polished, they are beautifully shiny and pleasant to the touch. They have strong metal luster and can keep glossy permanently. They will delight you and your lovers or friends for years to come. Chain Length approx 22inch + 2inch extend chain.